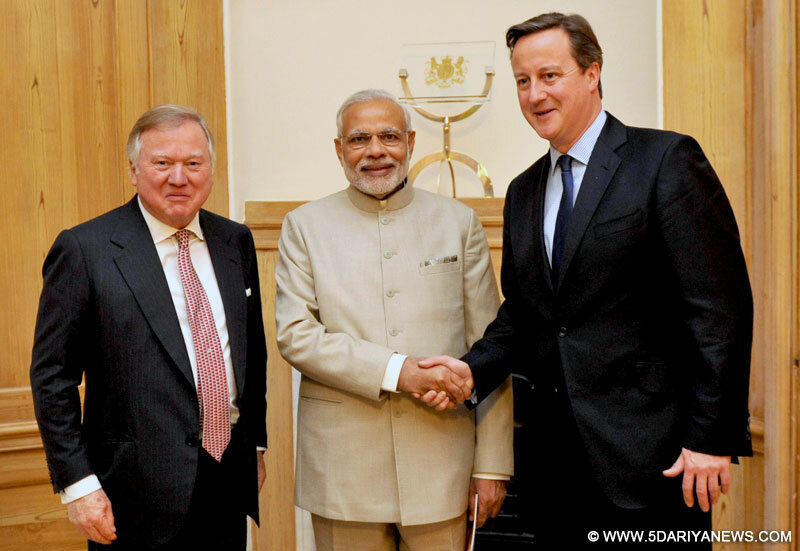 The Prime Minister, Shri Narendra Modi being received by the Prime Minister of United Kingdom (UK), Mr. David Cameroon and Mrs. Cameron at Wembley Stadium, in London on November 13, 2015. British Prime Minister David Cameron on Friday said a time will soon come when there will be a British-Indian prime minister.Addressing 60,000 wildly cheering British-Indians awaiting to listen to visiting Indian Prime Minister Narendra Modi, Cameron began with an Indian style of greeting: ”Namaste Wembley!”“It won't be long before there is a British-Indian prime minister in 10, Downing Street,” Cameron said citing the contributions of British-Indians in various fields.He said that “India-UK ties are about people and about prosperity”.“PM Modi and I govern in challenging times but we are united by the scale of our ambition,” he said.He also backed India's claim for permanent membership in the UN Security Council.“When it comes to the UN, we know what needs to happen - India with a permanent seat at the UN Security Council,” Cameron said.“Team India and Team UK, together we are a winning combination,” Cameron said. Stating that Prime Minister Narendra Modi has proved his critics wrong, the British prime minister said: “They said a chaiwallah can't govern the world's largest democracy and he proved them wrong.”Adding to Modi's pre-election Hindi slogan of “acche din aane wale hain”, Cameron said: “Acche din zaroor aayega” (Good days will definitely come). Cameron also chose to greet Gujarati-origin people present at the venue with “Kemcho Wembley” (How is Wembley). Earlier, Cameron and his wife Samantha, wearing a traditional Indian sari, welcomed Modi as he arrived at Wembley Stadium.After Modi met organisers of the Wembley event, the two leaders interacted with a group of Indian-origin people, who performed in the cultural extravaganza that preceded Modi's speech.Britain is home to a 1.5 million-strong Indian diaspora.